 Chamber Size 8″H x 7″W x 8″D. Wall to wall.  Includes full furnace electronics: MHI HIPAN  Control Panel. Customer must specify wiring requirements. 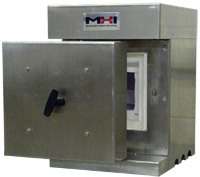 MHI HIPAN  control panel with full furnace electronics. temperature, PID temperature control, adaptive tuning. Programming Capability: 1 program with 16 Segments. Maximum power output is 12kW. MHI offers Academic and Industrial discounts. Please call for information.